PHILADELPHIA, PA – In 1871, Octavius V. Catto was gunned down on South Street as marauding whites created havoc on municipal election day. He was only 32 at the time of his death. In the wake of the Civil War, Catto was a fearless civil rights activist fighting for an equitable society. Moreover, Catto was an educator, scholar, writer, and pioneering baseball player – at the time quite an accomplishment in and of itself. In his life, well before the civil rights era of the 1950s and Rosa Parks refusal to sit in the back of a Montgomery, Alabama, city bus, Catto fought to pass constitutional amendments enfranchising black citizens, successfully protested to desegregate Philadelphia’s trolleys, and then he worked to secure the right to vote for black citizens. Obviously, at the time, his acts were a tremendous threat to white society. And despite his accomplishments, he was rewarded with an assassin’s bullet on election day, actively fighting for the rights of black citizens to vote in Pennsylvania. It was the first election where Philadelphia’s African American population was allowed to vote, thanks to the 15th Amendment, which Catto helped push Pennsylvania to ratify. Until now, Catto was seemingly erased from history books. But this year, more than 140 years after his murder, Catto is finally receiving the recognition he deserves as an early champion of civil rights. On September 23, 2017, Catto’s statue was unveiled outside Philadelphia City Hall. 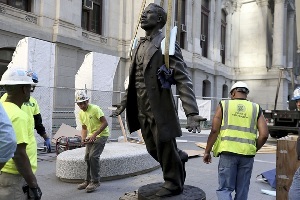 Catto’s new statue marks Philadelphia’s first public sculpture honoring an African American. This was all possible because nearly 15 years ago, Philadelphia Mayor Jim Kenney, learned of Catto and began making efforts to memorialize him. Catto’s fight for racial equality is far from over today. But luckily new laws have been created since his death that help ensure a more equal world. In particular, employees and job applicants are protected under the federal, state, and city laws from unlawful employment decisions and treatment based on their race. Title VII of the Civil Rights Act of 1964 protects applicants and employees from unfavorably treatment because of their race or because of personal characteristics associated with their race, such as ethnicity or national origin. Such characteristics associated with their race include a person’s skin color, hair texture, or certain facial features. Under Title VII, if a person is discriminated against when it comes to pay, promotions, layoff, training, fringe benefits, hiring, firing, job assignments, and any other terms or conditions of employment, such conduct is prohibited. Additionally, race or color discrimination can also involve treating someone unfavorably because the person is associated with or married to a person of a certain race or color. It is also important to note that discrimination can occur even when both the victim and the person accused of discrimination are members of the same protected class. Likewise, for employees living in the State of Pennsylvania, or the city of Philadelphia, there are additional protections for employees and job applicants. If you feel you have suffered discrimination on the job or at your college campus, contact one of our Philadelphia sexual harassment attorneys at the Derek Smith Law Group, PLLC today for a free consultation. Our attorneys have years of experience litigating claims of gender discrimination. Working together with our New York City sexual harassment attorneys, we have recovered millions on behalf of our clients. If you feel you have been discriminated against because of your gender, please give our attorneys a call, toll-free, at 1877 4NYLAWS, for your free consultation. Call today to schedule a FREE sexual harassment or employment discrimination legal Consultation in NY, NJ & PA with one of our top-rated employment law or sexual harassment attorneys here at the Derek Smith Law Group. You can reach us online or by calling 877.469.5297. Our New York City, New Jersey and Philadelphia labor & employment law attorneys handle a variety of cases involving sexual harassment, racial discrimination, pregnancy discrimination, and other employment-related claims. We serve clients throughout New York, including Manhattan, Brooklyn, Queens, the Bronx, and Staten Island. We also have offices in New Jersey and Philadelphia to serve you.